The next BLART! from the SCC is in tribute to Jeff Lemire. A Canadian writer and illustrator who has worked on titles such as Sweet Tooth, Essex County and The Nobody. I first came to know about Jeff Lemire through a podcast which he appeared on. He was promoting Sweet Tooth as the first issues release was imminent. For a limited time he was offering free sketches to anyone who bought the first issue and sent it to him with a self addressed stamped envelope and he would also sign the issue all for the price of postage. Myself and Mark 'Son of Ken' Hughes decided to take advantage of this and sent our copies off. I also sent off a letter that I wrote for him saying thank you for offering this deal and as a way of telling him that I enjoyed his work. I also did a sketch of Gus from Sweet Tooth which I included in the package. When sending it I thought I made a mistake with the postage and he wouldn't receive it so I sent another again with a letter and sketch for him. It turned out a while later that he had recieved both packages and he signed the 3 issues he recieved and gave one sketch for each including the Hellboy one I requested for Mark (as he is a big fan), eventhough he had stated on his site that he wasn't taking requests. He also sent a lovely hand written note to me saying thanks and he's glad that I liked it. Months later Mark had been in contact with him for a while and had mentioned that he works in a comic shop and how much recieving the sketch and letter had made an impact on me as I began my university life. Jeff Lemire had decided to send a package of stuff for Mark to give away in the shop to customers. After a while the package finally arrived with signed copies of all the issues of Sweet Tooth a variety of signed promotional material and a signed copy of the first collection of Sweet Tooth for Mark. Jeff Lemire has proved himself to be one of the nicest comic creators working today and to show our thanks and support for him and his future endevours we have chosen to pay tribute with our next BLART! 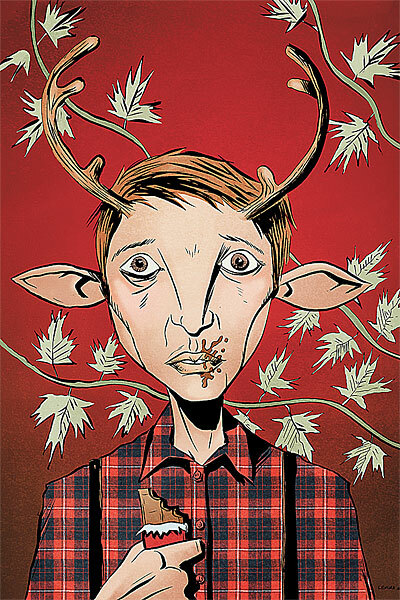 Check out the site soon for our Lemire themed BLARTS. Great post, petermaggs. I'm nearly there on my blart, hopefully going to ink it tonight.